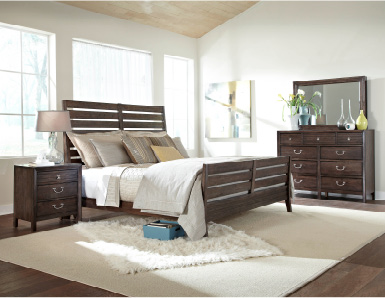 Ultimately we all want our living spaces to be comfortable, functional, welcoming and beautiful. Some may want more or less of each of these attributes. Some may even want their home to look like a page out of a magazine while others would be happy with a clean and well organized space. Over the years, there has been much debate about the best spot to place the television in the room for ultimate viewing comfort as well as most aesthetically pleasing. The debate changes constantly as technology changes and improves. Many consider the black rectangle to be an eye sore against their meticulously designed and furnished space, while others admit that its presence in the space is of utmost importance and that it should be the main focal point of the room. Often these conflicting views come from the same household! 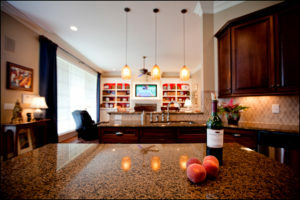 So what do you do when you can not seem to see eye to eye when it comes to laying out your living space? We hope these tips can help you. First of all, take into consideration how important the TV is in your space. Does your family all use the TV at the same time or does it get used by individuals at different times throughout the day or evening? This factor might not only affect the placement, but also the furniture arrangement around the TV. If the whole family likes to plop down in front of the TV together, than most likely you will want to have it “front and center”. 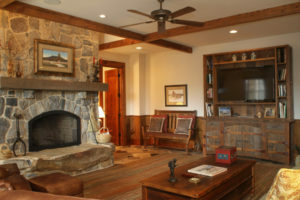 If the TV is secondary to conversation, game time, or just not used much, you might be able to get away offsetting it in the room, within a built-in, an armoire, or over a small console that works well with the room’s primary focal point such as the fireplace. Another opportunity is to create a gallery wall on the same wall your television will sit. 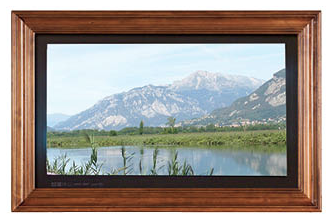 You can use different sized framed art and canvases or even sculptural pieces as well. 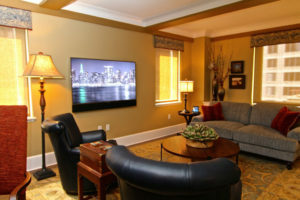 Display the pieces above and on both sides of the TV, so that it gets blended in the mix of your beautiful art gallery. 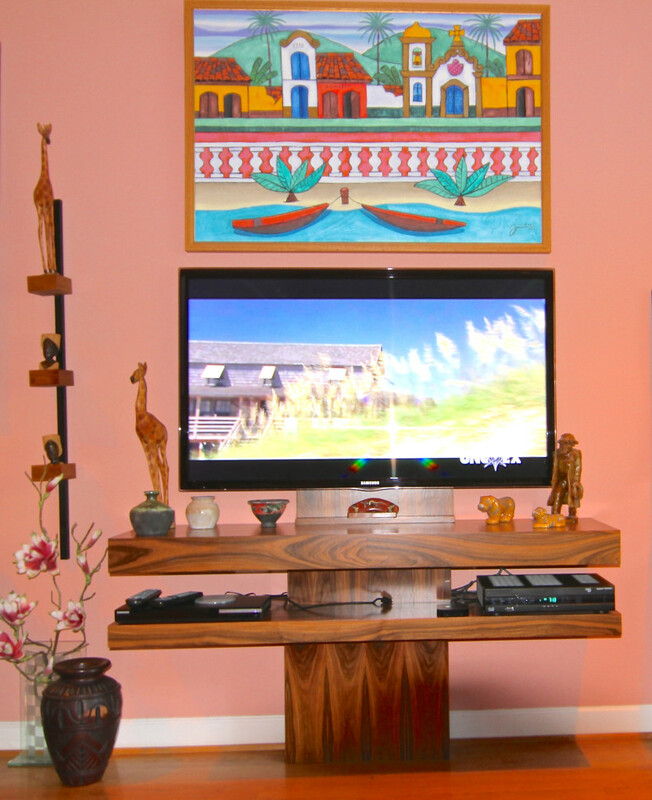 A custom designed console can also easily add to the art display. Some individuals are okay with embracing the TV in all its glory. 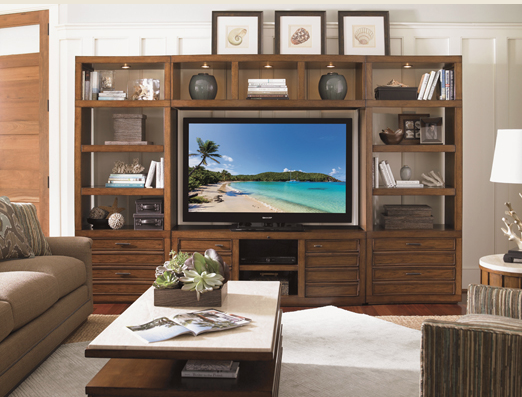 In this case, you can select a favorite piece of furniture to host the TV (either on it or on the wall above it). It does not have to be a media console with glass doors any more. 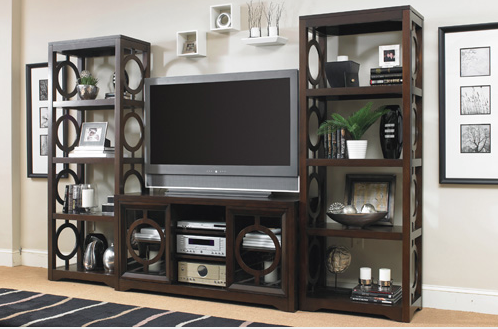 If you want to hide all your DVD’s electronic boxes, you can use a unique piece of furniture with solid doors. Just make sure it is vented properly and use red eye technology in order to use a remote. 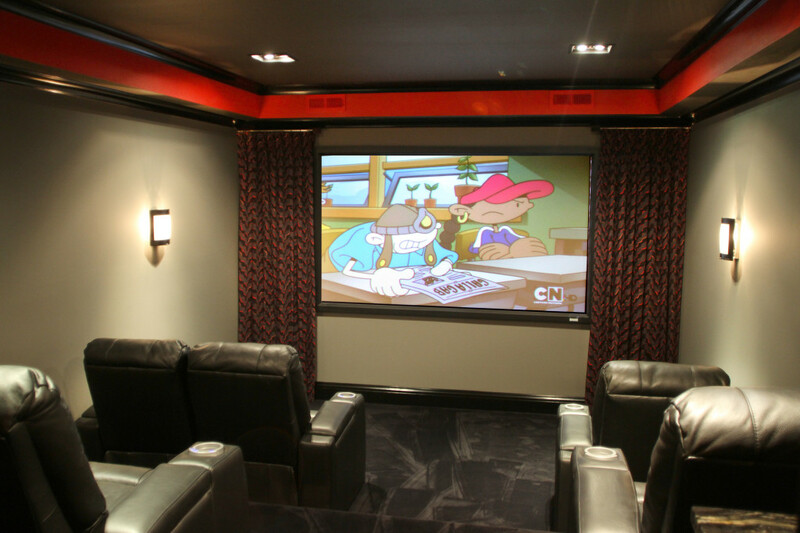 Lastly, when dealing with the issue of hiding the screen, you can always consider high tech equipment that will conceal your TV screen with art in a frame that lowers and rises with the flip of a switch. 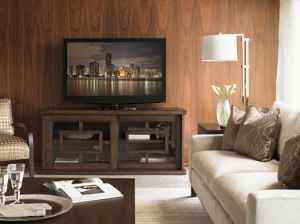 Some furniture manufacturers even offer media walls that will lower your flat screen TV down into the console so you don’t have to see it when not in use. Wall Cabinets are yet another option. 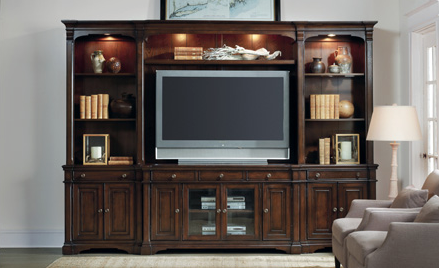 They are decorative cabinets that mount to the wall the size of the screen with doors that close to conceal the TV and can open for viewing. Another issue that comes up in the placement dilemma is dealing with two focal points. 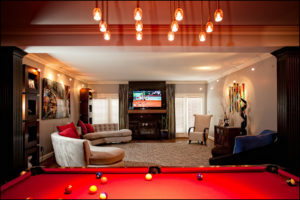 Many people do not want to mount their TV over their fireplace because of the height which can cause some strain on the neck from such a harsh degree viewing angle. But working with two focal points in the same space can be tricky. The seating placement needs to be carefully considered so that both focal points are given direct viewing access – one cannot overpower the other, as ultimately a room can only have one true focal point. Here are some suggestions from the experts at THX (THX Limited is a high-fidelity audio/visual reproduction standard for movie theaters, screening rooms, home theaters, computer speakers, gaming consoles, and car audio systems. The current THX was created in 2002 when it spun off from Lucasfilm Ltd.) They advise that the optimal viewing distance would support a 40 degree angle view from the viewer’s eye level to the screen where the maximum viewing angle would be at 28 degrees. And as for the distance itself, for a 35″ screen the viewer should be 3.5′ to 5′ away, 40″ screen should give a distance of 4′-6′ away, 50″ screen would be 5′-7.5′ away, while a 60″ TV needs to be anywhere from 6′-9′ away. How does your family deal with this love/hate relationship? 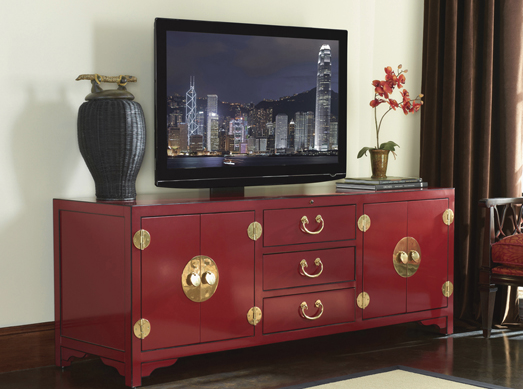 Do you completely conceal, showcase, or just camouflage your TV? Or are you still stuck in the rut of not knowing what to do? 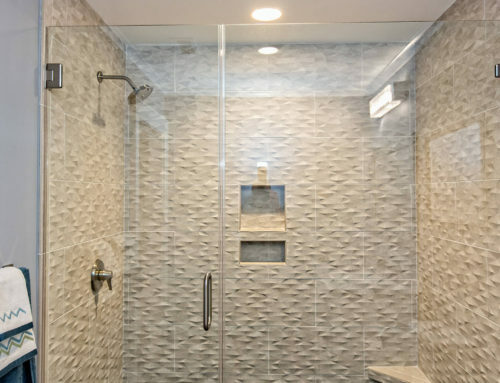 If so, give us a call and we will turn your design dilemma into a beautifully functional living space.